Mega Sale! Save 26% on the Wine Bottle Opener Set - Corkscrew Opener - Rabbit Wine Opener Kit - Foil Cutter - Stand - Extra Spiral - Easy Open Wine Bottle by NADIANO Wine Opener at Verve Wine Bar. Hurry! Limited time offer. Offer valid only while supplies last. ① All-Inclusive 4 in 1 Rabbit Wine Bottle Opener Set for Real Wine Lovers The best professional 4pcs corkscrew lever kit for wine bottles. The best professional 4pcs corkscrew lever kit for wine bottles. Everything you ever need to open a bottle of a good white or red wine with ease. You should definitely have one of these wine openers sets. Make the opening of your favorite wine bottle simpler than ever! Only several seconds enough to pull the cork out of the bottle, using our corkscrews levers with foil cutter. It's really easy for everyone: men, women or seniors, and no matter how strong you are, the only thing you'll need to get the corks out - is our universal wine opener! The vintage bronze / copper / gold style with robust mechanism, stand and replacement spiral makes these corkscrews levers kits the best sellers on the market. It will look great on the bar table, at your home, kitchen or in your office. Are you looking for a perfect and universal gift for your friends, colleagues or family? Then we have one that suits well for any occasion: wedding, birthday, anniversary, housewarming, christmas, thanksgiving, garden or dinner party. Whenever or whoever you'll offer it: to your best friend, father, mother, sister, brother or a nephew, they will definitely appreciate it. Such kind of gifts are worth to buy, so don't hesitate - buy it now and you'll love it ♥!  EASY ----- with Nadiano rabbit wine bottle opener it's very easy to open a white or red wine bottle of any size. Women, men and seniors can easily pull the cork out of the bottle with minimum effort in less than several seconds.  4PCS PACK ----- inside the box you'll find our 4 in 1 set that contains: manual corkscrew lever with foil cutter, stand / base and one replacement spiral / worm as a gift. These wine openers kits are the best sellers sets on the market. What else do you need to easily pull the corks out?  DESIGN ----- our wine bottle opener set was designed to complete the look of any home, kitchen, office or a bar table. The luxury gold / bronze / copper design combines the best wine traditions and vintage style. It's the best and the most universal gift for any occasions: birthdays, weddings, anniversaries, housewarmings, christmas, thanksgiving, garden or dinner parties. These kinds of gifts are very handy, and these are the most beautiful corkscrews you may ever buy. 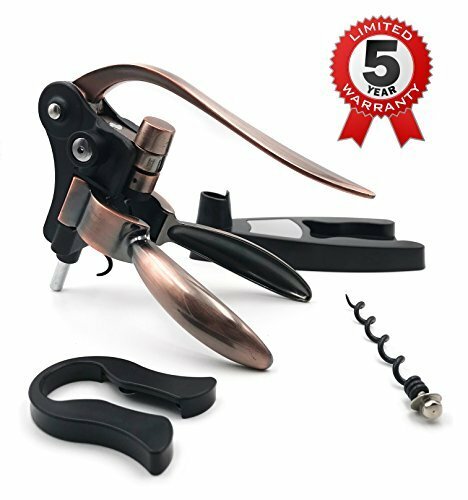  QUALITY ----- our professional & universal corkscrew lever for wine bottles of any sizes is made from high quality materials, equipped with a robust mechanism and have a replacement spiral to serve you longer. We have very high quality standards and test all our openers before selling them. ⛱️ WARRANTY ----- we want you to be happy with our corkscrews sets and this is our main priority. That's why we offer the best guarantee and will replace the product or reimburse it without asking the questions. Your opinion is very important to us, it helps to improve our products & services. If you're not happy with something (sometimes it may happen), simply drop us a message and we will solve the problem. Please contact us for more information, even after Amazon return window was closed. If you have any questions about this product by NADIANO Wine Opener, contact us by completing and submitting the form below. If you are looking for a specif part number, please include it with your message.